A birthday month can never have too much cake. Here’s another Sky High inspiration that would work better as a sheet cake due to the slip sliding away these layers did with the delicious gooey frosting. I’ve had this earmarked for over a year and am so glad I didn’t wait a minute longer to try it. Having tried several Sky High cakes, I trolled the interweb to see what others’ thoughts were. I made some changes from the get-go so that we’d get some serious flavor the first time around. Her (Alisa Huntsman’s) cakes are always lovely, but sometimes they just leave me wanting more. Flavor that is……..not cake (although, more cake is always nice, too). The results were STELLAR – this one’s a knockout that will surely bring you oooos and aaaahs. If you like cake there’s a slew of it right here! grease three 8″ round pans and line the bottoms with parchment and grease that too. 2 Tablespoons worth, set aside. Beat on low until blended then turn to medium speed and beat until light and fluffy. Add your reserved egg mixture in three installments – mixing just to incorporate and scraping down the bowl and after each addition. Divide batter equally among your pans. Bake at 350° for 25-28 minutes or until a wood toothpick comes out clean. You do not want to over-bake they dry out in a hurry – they do NOT need to brown and pull away from the edges – it just needs to be done in the center. Cool on rack for 10 minutes then invert and remove parchment paper. Mary, you’re the QUEEN OF CAKES!!! Mouthwatering recipe! I LOVE Chai Tea! I’ll give it a go….in a sheet pan. Good idea for us ‘show-cake’ novices. I have been absolutely craving a chai cake or cupcake, and this just makes me want some even more! looks incredible! Wow, what a fabulous cake! The frosting sounds so good! The flavor combination in this sounds absolutely fantastic – cardamom, ginger, chai. Yum! Can I please have a piece! This looks delicious. I am on a tea kick, so this will just throw me further in to a tea tizzy. Oh, yum! Cake! I like the Heaven and Hell cake. That appears to have lots of different flavors going on, but I bet this one is tasty, too. All I can say is YUM YUM YUM!! Great recipe and beautiful photos. That honey ginger frosting looks so GOOD! Haha, I was really amused to see your post today, because I had a similar cake-melting experience last night! Oh man! At least both our cakes tasted good! oooooooooh want to make this one right now! This looks and sounds sOOOOOOOOOOOOO GOOD! 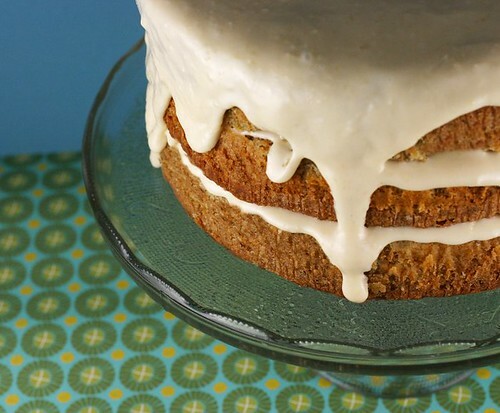 Love the flavor of chai tea…this cake looks amazing…awesome job! This cake is a masterpiece!!! I am loving this cake – love the delicate flavors of chai and your presentation is mouth-watering! OMG – that really is a show stopper! Gorgeous photos – makes me want to claw my way through the screen! What a beauty she is! Stunning. How I would love a slice of this cake. I just found your cake on foodbuzz! It looks amazing and I can’t wait to try out the recipe 🙂 Trying new cake recipes is one of my favorite things to do! I love Chai. This looks amazing. I am bookmarking it for my next cake baking adventure. Thanks, Mary. This cake looks great. I’ll be passing the recipe along to my daughter, who is fast becoming the Queen of Cakes! This sounds lovely! I love your photos, too! How did I miss this?? I’m finally getting around to looking at my foodbuzz inbox… and sadly I’m at 412 that I haven’t looked at…. Love chai and this cake looks fabuloso!!! gold stars! Wow, a recipe and fantastic photo of the result! This has re-inspired me to continue with my attempts at food photography. Thanks to my photo-shooting pal, Dan (1000 Word Photo) for directing me here. Thanks Rob – you are far too kind! I have my camera and photoshop to thank – my skilz are minimal! Excellent cake! As an experiment, I added a touch of lemon juice to the frosting. Wow! The cake was perfect with a slice of lemon garnish and a cup of hot cider. Wonderful Grubby. I love that you added the lemon, it sounds spectacular! Hello! This is an older post so I hope you see this question. I was wondering if you could please describe the texture of the cake? Since it has extra egg yolks, is it less fluffy and more dense? 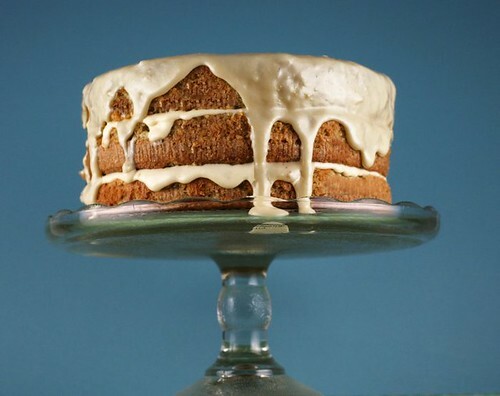 I’m looking for a flavorful, light chai cake and hope this one is it! Thank you! I remember this cake was so tasty, but on the drier side. It wasn’t particularly dense, nor was it light and fluffy. It was light enough that the bottom layer didn’t smoosh with the weight of the top two layers.